INDIANAPOLIS–Texas safety Kenny Vaccaro is an ideal fit in today’s style of football. Vaccaro can be used in several roles, which means he’s an every-downs defensive back. “I can play both safeties, nickel, dime and, in some instances, I can play corner,” Vaccaro told reporters at the scouting combine on Sunday. At 6-0, 215, Vaccaro is big enough to support against the run and his 4.5 speed gives him the range to be a dependable back-end coverage guy. There are few red flags on Vaccaro, which has him ticketed for the first round of this year’s draft. Vaccaro and LSU free safety Eric Reid are considered to be the top two safeties in this year’s draft. INDIANAPOLIS–Georgia’s Bacarri Rambo is ranked by draftniks as one of the top safeties in this draft. Rambo says he’s the best. “I consider myself the best. I’ve been getting better every year,” Rambo said at the scouting combine on Sunday, as the defensive backs class began a process that will lead to their workout at Lucas Oil Stadium on Tuesday. Rambo is a strong prospect for teams seeking a ball-hawking free safety. He intercepted 16 passes in his college career, including eight in 2011. He returned two picks for touchdowns and intercepted a pass in the Senior Bowl a month ago. Rambo is thought to project as a third or fourth-round pick. INDIANAPOLIS–Defensive lineman Jesse Williams is a perfect candidate for a team in need of a defensive lineman in a 3-4 scheme. “I like stopping the run, being physical. The 3-4 is suited for me,” Williams said at the scouting combine. A native of Australia who used junior college football as a stepping stone to Alabama and two national championships, measured out at 6-3, 323, and figures to impress scouts with his dominant strength. “I just want to get through the medical stuff and then show them how I move,” he said. Williams’ body is covered by tattoos that “are little reminders of things I’ve had to get through,” and he spoke with a thick Australian accent. He’s a prospect to be drafted late in the first round, but he could move his stock upward with an athletic workout on Monday that would also project him as a defensive end in a 3-4. INDIANAPOLIS–Ohio State’s Johnathan “Big Hank” Hankins is one of the top prospects in a deep crop of defensive linemen in this draft. Hankins might be especially tempting to the Packers because it’s believed his talents lend themselves to a 3-4 defense. “In a 3-4, I can play end or the nose,” Hankins said. Hankins measured in at 6-2, 320, and will workout at the scouting combine on Monday. He will not participate in the bench press drill, as he will leave that for his pro day. “I’m going to show my motor, let my efforts speak for themselves,” he said. INDIANAPOLIS–Brigham Young’s Ziggy Ansah is arguably the fastest-rising player in this draft class, and he’s poised to crack the top 10 picks should he turn in a lights-out workout on Monday. “I have a lot to do to catch up with everybody,” Ansah told reporters at the scouting combine on Saturday. Ansah left Africa to play basketball at BYU. He had never watched an American football game until he arrived at BYU. “Since basketball didn’t work out, I said go do football,” he said. Now he’s coming off an MVP performance in the Senior Bowl and he’s being compared to Jason Pierre-Paul. Is Ansah a defensive end or an outside linebacker? That’s the big question that has to be answered. There’s no question that he’s a rare talent who should excel in the gym-class type workouts that define the combine. Ansah is also an engaging personality who entertained reporters. When asked who was the best lineman he faced at the Senior Bowl, Ansah said it was the tackle from Oregon State. “I got held a lot in that game and it was never called, so I guess it was him,” he said, drawing a big laugh. Ansah knows next to nothing about the history of professional football and its legendary names. “I have no idea who they are, but this is going to be my lilfe so I try to soak it all in,” he said. INDIANAPOLIS–The NFL is considering a plan to move offseason events back in the calendar next year. For example, the scouting combine would be moved to March, the start of free agency to April and the draft to May. “Whatever the league thinks is best, count me in,” New York Giants GM Jerry Reese told reporters at the scouting combine on Saturday. Reese heads the personnel department of a team facing salary cap problems similar to those confronting a lot of teams with star-quality players: A flat cap is forcing tough decisions. “The cap stays flat and the dollars don’t make sense. You have to make tough decisions. When your cap is flat for 3-4 years, it’s tough to keep a lot of high salaries,” Reese said. The Packers faced that situation recently when they released Charles Woodson; Greg Jennings continues to head toward free agency. The Giants released Ahmad Bradshaw. All of that puts an increased burden on teams to replace those types of esteemed veterans with young, affordable talent, but drafting near the bottom of the order increases the degree of difficulty, as the league’s system for parity prevails. “When you’re picking 32nd in the draft, a lot of the players you’re picking are developmental,” Reese said. “Old-fashioned scouting is what we hang out hat on. We depend on our scouts. They see them practice. They see them play. They talk to the coaches. 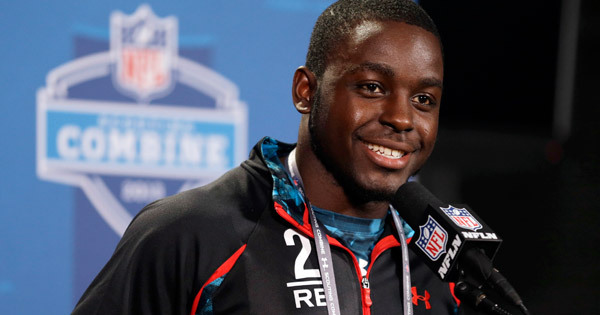 INDIANAPOLIS–Wisconsin running back Montee Ball spoke eloquently to reporters on Friday, leaving little doubt he’ll be a big hit in interviews with interested teams. Ball entertained reporters with a calm and confident presentation. “I’m really looking forward to the interviews and showing teams how I can apply my intelligence to the playbook,” he said. He compared his running style to that of Hall of Fame running back Curtis Martin, which is to say nothing flashy but very steady and productive. INDIANAPOLIS–Broncos GM John Elway knows something about playing quarterback, and he’s not of the mind that NFL-ready quarterbacks are getting harder to find. “I think the quarterbacks are better. We’re getting guys that are much more prepared to play the position when they get to the NFL,” Elway said at the scouting combine on Friday. Elway has quickly turned the Broncos into a Super Bowl contender. They were 13-3 last season but lost their first game in the playoffs. “We make our money in the regular season, we make our legacy in the postseason. You don’t have next week. In the postseason, you have to be able to play in sudden death,” Elway added. INDIANAPOLIS–At times last season, the New York Giants flashed the talent that made them Super Bowl champions in 2011. So why did they miss the playoffs? The popular theory is the Giants let success go to their head. Did league rules limiting contact in practices hamstring Coach Tom Coughlin in what he could do to deal with his team’s malaise? “How do we make the players understand that even though it’s a jog-through, it’s an important practice?” Coughlin said of the impact of rules limiting the demands coaches can place on players. What the Giants appear to be doing in this offseason is using change to send a message of urgency. The release of running back Ahmad Bradshaw may have sent that message.